Friends, this post has been a long time coming. Every year when January rolls around I tell myself this is going to be the year I’m more organized. I buy a planner, throw out some clothes, organize my kitchen and I let the organizing steam fizzle out until next thing I know it’s been 12 months and I’m back where I started. Don’t get me wrong, I’m semi-organized, I have a few systems in place and you can find a dozen or so organizing posts on this blog. This year when those thoughts of purging all the things started to bubble up – I had an idea to make it a group effort. 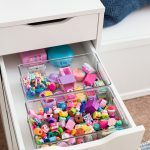 I seriously believe everything is done better in community, so I shared the idea of an organizing/decluttering challenge to you all on Instagram and it got an overwhelmingly positive response! 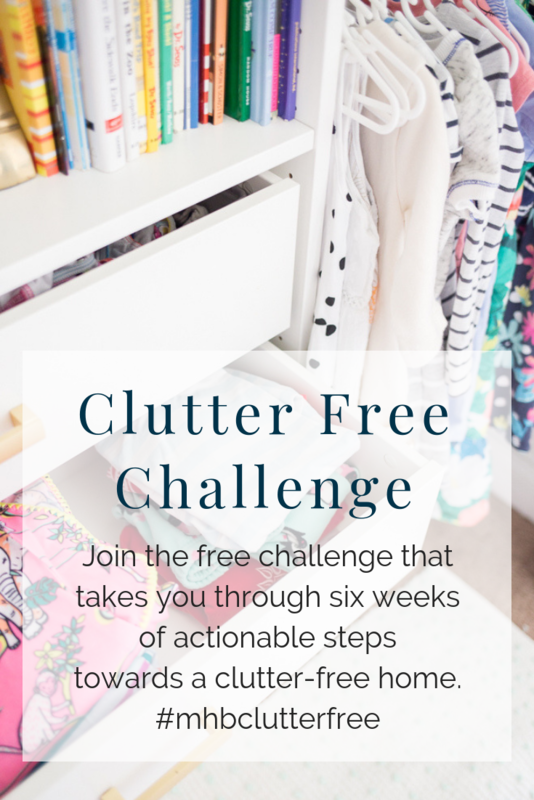 I’m so excited (and a little nervous) to introduce you to the Clutter Free Challenge – a six-week guide to decluttering your home! Declutter your home with me! First, I’m using the word “guide” loosely here. As previously mentioned, I am no expert (I have a real home tour to prove it). 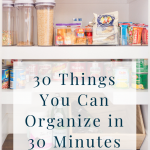 What I did do is put together a big ol’ spreadsheet full of things that I know a lot of us struggle with when it comes to organizing/decluttering. I’m using that information to steer the challenge. 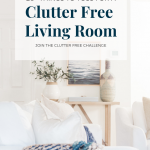 I will be participating in each week right along with you guys – decluttering my own home and I’ll share my progress and ideas each week here on the blog. This is plan is not 100% complete. The task of organizing an entire house can feel extremely daunting. I’ve honestly lost sleep at night thinking about the time it would take to completely overhaul my organization systems. That’s not what I want for any of us. What I think is most beneficial is to go through several spaces in your house, week by week, making a habit of getting rid of unused, and unwanted things. I want us to take those six weeks to begin decluttering our homes. After the six weeks, you’ll likely still have a few places in your house that could use some attention but a pretty big chunk will have been tackled and you will feel amazing about it. You have to start somewhere, that’s what they say anyway! Use this plan in a way that is most helpful to you. 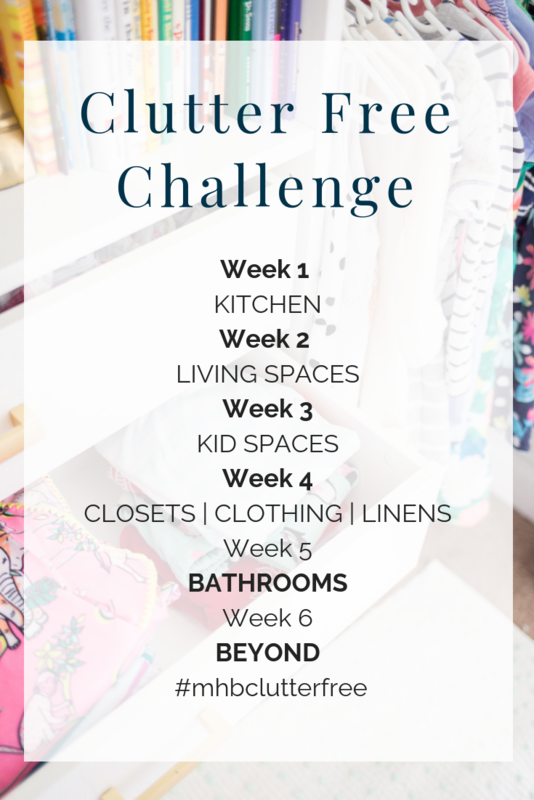 I’ve created this weekly challenge in a way that should help each of us tackle spaces that need it most but if we get to the kitchen week and you’re like, Chels – my kitchen is good – my label maker and I tackled that last year, that’s okay! Consider tackling a space that isn’t covered in the challenge instead. I would encourage you to just keep going! Okay – here’s the plan! Each week we’ll focus on one space/room/objective. I’ll give you an idea of things can declutter, organization tips and specific project ideas to help get organized. If you’re joining in – please let me know in the comments! 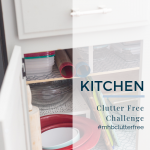 You can also participate by using the #mhbclutterfree hashtag on Instagram! It will be so fun to see our progress as we go! Hi. It’s Char and i’m In! yes!! So happy you’re joining Char! Yay, Katie!! We’re going to be so organized!!! Hooray!!! I’m excited you’re joining in Sharon! I need to do this so bad, we shifted 2 years ago and I still have boxes in the garage. Need to change that. I’m in. I’m always up for a good challenge and getting organized is what I really need now that I’m back in the workforce full time with 3 kids and a lot of extra curricular activities. Thank you for the invite! Great! I think the challenge will kick a lot of us into gear! I’m in! Just started decluttering a couple of weeks ago, so this should be incentive to keep going. I’m in! Although, do to health issues, it may take me a little longer, but I definitely need this! Late as usual, but all the more ready for the challenge! Yay! 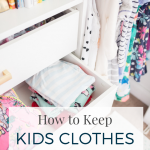 I actually did clothing items this past week–got rid of two hampers full! Excited to get rid of more items and simplify! I’m ready so count me in! So happy to have you, Colleen! I’m definitely all in for being clutter free! Thanks for being a trusty tour guide… I appreciate the help since I struggle figuring out where to start and what to do next… you’re the best!